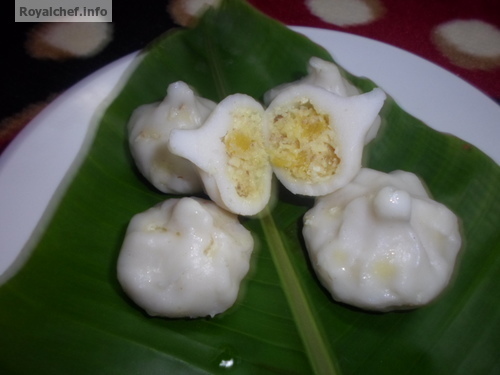 This is a Recipe for preparing at home tasty Pineapple Modak or Ananasache Modak in the Marathi language. 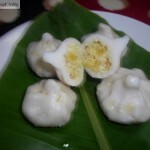 This particular Modak recipe is a delight for the lovers of Pineapple. If unable to get fresh Pineapple, tinned Pineapple can be used. 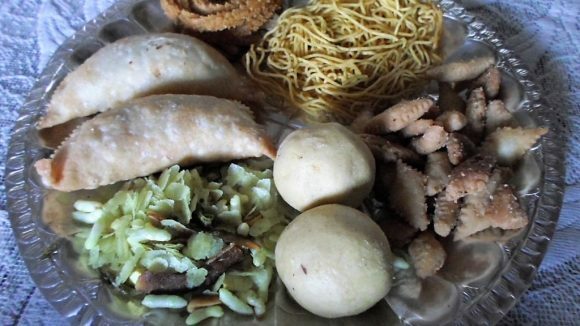 The ingredients given below are based upon my experiments in preparing this Modak, you can, if you so desire modify it to your liking or taste. Mix the grated Coconut, Milk and Sugar and cook for five-seven minutes and then add the Pineapple pieces, yellow color and cook until you get a thick mixture. Add the Pineapple essence, dry fruits, mix it well and keep it aside. Boil on cup water in a vessel and add the Salt, Oil, Rice Flour, Refined Flour, mix it well and cover with a plate and cook for two minutes on a slow flame. Remove the cooked Rice Flour from the vessel and prepare Dough. Prepare Lemon size balls from the Rice Dough and then pat the balls on your palm and flatten then to make Puri like shapes and then insert a table spoon of the Coconut mixture and it the shape of a Modak. Boil two big glasses of Water in a Vessel and keep the strainer over the Vessel, keep the Banana leaf over the strainer and arrange the Modaks over the Banana leaf and then cover the strainer with a stainless steel Plate. Steam the Modak for fifteen minutes. Serve hot. While serving add Ghee over the Modak and then serve.